Dental Assistant Salary – Is this Profession Right for You? The choice of being a Dental assistant is a good one that is highly sought after nowadays. It is very rewarding and the stability of the career makes people to enjoy the job. Duties such as assisting the dentists or dental hygienists that are directly providing primary care dental services to patients as well as sterilizing, preparing and inventory control of dental instruments and supplies are all part of the job description of a dental assistant. However, there are a few factors to consider if you want to go full-time with this career. The quickest way to get trained as a dental assistant is to attend a technical school; you can complete a program in less than a year, or sometimes in just 13 weeks like at the Dental Assistant School of Nashville. Some of the best technical schools, like Nashville, even offer what is known a externship which will allow you to practice your skills in the real world. Potential employers are usually very impressed if you pass through this route; in fact sometimes students were almost instantly employed by their internship provider and this makes searching for a job quite unnecessary once you complete the program. A dental assistant aids patients by answering questions and also gives them directions as per instructions from the dentist or dental hygienist. Dental assistants also serve as the chair-side assistants of the dentist or dental hygienist. A dental assistant is in charge of the preparation of instruments to be used for the treatment of patients as authorized by the dentist or dental hygienist. 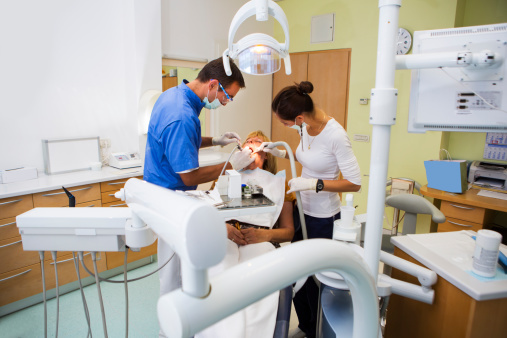 Dental assistants maintain the equipment in the Dental Department as guided by manufacturer’s directions and the policy and protocols of the Dental Department. A dental assistant is also responsible for pulling the files and charts of patients as often as needed. All these and a few more are the duties of a dental assistant. As regards skills, you will be required to have all-round knowledge of techniques in dental assisting and the corresponding procedures for all degrees of general dentistry. You must be knowledgeable about modern dental materials, how they are stored as well as handling and application of the materials. As a dental assistant, you are expected to be sensitive to the concerns and expectations of dental patients and be capable of empathizing with and respond to them in a manner that is as professional as possible. It is also necessary to have the ability to work with persons that belong to a wide diversity of ethnic, economic and social backgrounds. Dental assistants have been known to go on and become dental hygienist since this particular program is offered in the same institutions that dental assistant students attend. During your training on the job, most times the members of the dental office teach you the tasks involved as well as terminologies, names of various instruments and other duties, thereby helping you catch up and learn fast. In some rare cases, you might end up being in charge of duties in the office. You will be in charge of scheduling appointments with patients and even sending patient bills. You will have the opportunity to become a specialist in a definite area as you work alongside a dentist. This will enable you get lots of experience which could be a determinant factor if you choose to move on in the future as a dentist. If per adventure you are employed in a hospital, you will have the chance to work alongside a certified dentist; this usually includes travelling to lots of places thereby affording you the opportunity to visit and work in lots of places you may not have otherwise visited. You will have be able to interact with different types of people on a daily basis; this would help you hone your interpersonal skills and also teach you how to comport, compose yourself and deliver lines in public to people of all ages and sizes without offending anyone. All in all, a career as a dental assistant is indeed very rewarding. Why not go ahead and take a leap of faith by going for it? Want to take the next step in becoming a dental assistant?… Simply call (615) 988-8484 or email and come visit the school today!